Froth flotation is the most widely used industrial process for the separation of finely liberated minerals. The process involves the aeration of minerals in water in the presence of flotation reagents which facilitate the attachment of air bubbles to and levitation of select minerals. Once at the surface, the select minerals are supported by a froth layer until they are removed. Unattached materials remain submerged in the pulp. The surface properties of a mineral determine its ability to float. 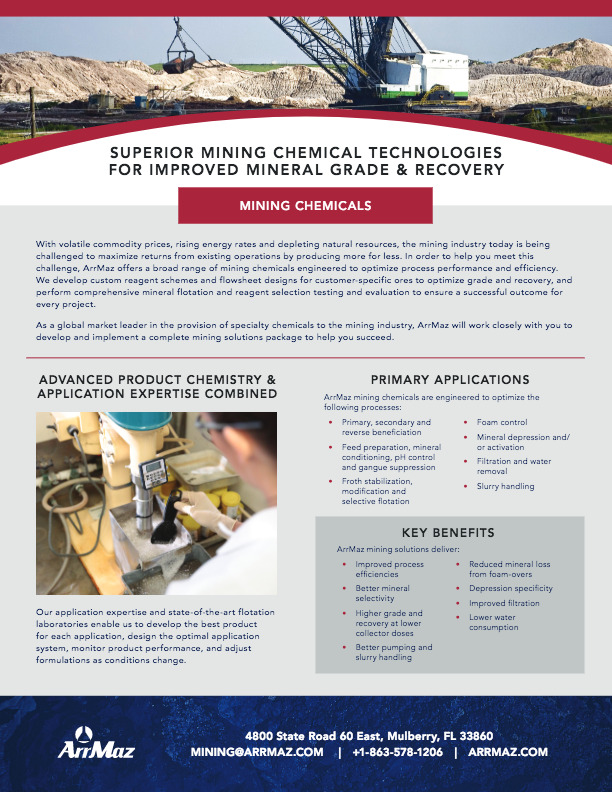 Collectors, some of the most important flotation reagents used in the flotation process, are used to modify the surface properties of minerals. A collector is a chemical that selectively binds to the surface of target minerals and imparts hydrophobicity to those mineral particles, a necessary condition for air bubble attachment. Collectors can generally be classified into three categories – nonionic, anionic or cationic. Nonionic collectors are simple hydrocarbon oils. Anionic and cationic collectors consist of a polar component that selectively attaches to mineral surfaces, and a non-polar component that projects out into the solution making the surface hydrophobic. Collectors can either chemically bond to the mineral surface with high selectivity (chemisorption), or be held on the surface by physical forces (physical absorption). Collector selection is critical for effective mineral separation via froth flotation. ArrMaz manufactures customized anionic and cationic collectors for specific ore bodies and flotation process conditions primarily for the flotation of oxide ores such as phosphate and industrial minerals. Our wide range of technologies used for anionic and cationic collector formulation allow us to provide the best collector performance available. Let ArrMaz work with you to develop and implement a complete, customized flotation reagent package to help you succeed.